Odd Days is a work in progress focused on the feeding troubles and on the long and hard way to recovery. I begun this project in early 2007 and during the years I visited over and over three different public centers for long term rehabilitation of Eating Disorders: Palazzo Francisci in Todi, Center Italy, Portogruaro Eating Disorder Rehabilitation Center in the Northeast, and Centro Gioia in the South. Palazzo Francisci is one of leading public centre for the treatment of this kind of ailments: it permanently puts up, for a minimum period of three months, ten to fifteen persons, men and women of different ages, that suffer from anorexia, bulimia and binge eating disorder. Moreover, an unsettled number of patients is in a semi-residence state, that means they daily take part to the activities of the centre, even though they stay in exterior accommodation facilities. “In Italy there are ambulatories, day hospitals but there’s a heavy lack of residential nursing home for the rehabilitative cure, states Laura Dalla Ragione, director of the centre. "there are about ten public clinics and a few private in the centre-North, but for who falls ill under Todi there is not a reference centre, neither public nor private”. The model of Palazzo Francisci is based on an integrated approach of several disciplines, from the behavioural and psychological therapy to the no-conventional medicine treatments: relaxation and meditation, auricular acupuncture, biological medicine, dance-therapy and support groups. A similar approach is practiced by La Casa delle Farfalle, in Portogruaro and Centro G. Gioia in Chiaromonte. All of these clinics are leading clinics in Italy, but there is not yet a national regulation for the treatment of Eating Disorders. Particularly in the south, but in the whole country too, it’s difficult to find a rehabilitation center that would admit very young patients (11-18): it is very common to hospitalize them in a children’s hospital where only a forced alimentation (the nutritive material is introduced into the stomach through a flexible tube) is possible. Due to their bond with the corporeal identity, with the self-safety and with the appearance obsession, the troubles of the food behaviour are very widespread and they well represent the contradictions of our time. Although they always have root in some personal trauma, the spreading of this symptom is also reinforced by a society where expecially woman “must be thin”. It is very diffcult to estimate the real number of people suffering of Eating Disorders, due to the fact that it is a relatively new desease, but what is clear is that the spreading of these ailments in the last 10 years has been literally epidemical, and it currently doesn’t spare even men and boys, besides appearing always sooner, even in a prepuberal age. A recent study states that in Italy Eating disorders are the first cause of death for desease between young women, aged 12 to 25. Simona’s arm with flowers. Residenza Palazzo Francisci. Todi (PG). Simona, 30, suffers of anorexia nervosa. I took this picture in late 2007, during her hospitalization at Residenza Palazzo Francisci. After the treatment, she went back to her parents and her job. We are still writing each other every week. She’s better, and gaining some weight. Todi (PG). Meals are called "therapy". The way the patient are nourished is known as "Self-Feeding". Self-feeding is a method studied to learn not to think of food or weight control: with this method, patients are taught to eat mechanically, to perform feeding in a mechanical way, behaving as a robot, thus emptying the meal of all meaning. The meal and snacks therefore become an external rule like a medicine to take at a fixed and prearranged time. Residenza Palazzo Francisci. Todi (PG). Federica, 13, during water physiotherapy. She was admitted to Portogruaro Clinic for a very serious form of Eating Disorder in 2008. The Clinic's equipe is allowed to extend the treatment for a very long period (one year, in Federica's case), according to the patient conditions. Portogruaro (VE). Giada in the common room. Giada is 16 and the youngest patient at Centro G. Gioia in Chiaromonte (PZ). She sufferes of anorexia nervosa. Pazienti durante la terapia psicomotoria. Centro residenziale per la cura dei disturbi dell'alimentazione Palazzo Francisci. Todi (PG). Sara, 28. She got sick with anorexia nervosa ate the age of 6 and always been seriously underweighted. After many hospitalizations and many relapses, she’s now at Residenza Palazzo Francisci, Todi (PG). One of the symptoms of this illness is self-harm. Most of the patients feel like they have to punish themselves for some reason. Alcohol and drug abuse are also very frequent. Residenza Palazzo Francisci, Todi (PG). Erika, 25, during her hospitalization in 2007. Now she is recovered and had a child. Residenza Palazzo Francisci, Todi (PG). Dancetherapy. Centro G. Gioia in Chiaromonte (PZ). A moment of group therapy. The patients are invited by the therapist do dance and then to talk about the emotions they felt. During the discussion many of the patients expressed the feeling of being ridiculous and inadequate. Some of them refused to dance. Residenza Palazzo Francisci, Todi (PG). Elena and Federica during physiotherapy. Residenza Palazzo Francisci, Todi (PG). Erika, during physiotherapy. Residenza Palazzo Francisci, Todi (PG). The waiting room of the clinic is temporarly converted to sleeping room. During the summer the number of requests of hospitalization usually doubles. Residenza Palazzo Francisci, Todi (PG). A.’s pictures. A., 17, keeps on her laptop some selfportraits taken in what she calls “the worts time”. At that time, her weight was 27 kilos. She sees herself fat now and cannot accept the idea of having a body. Residenza Palazzo Francisci, Todi (PG). Martina, 25, was hospitalized the first time in 2008 for a severe form of anorexia nervosa. Residenza Palazzo Francisci, Todi (PG). Chiara’s selfportrait. Chiara is 17 and was hospitalized for a severe form on anorexia. She practices selfharm and needs to be constantely controlled. La Casa delle Farfalle, center for the long term treatment of Eating Disorders in Portogruaro (VE). F.’s leg in her bathroom. A. and F. in their room. In the centre mirrors are forbidden and the patients are highly advised against touching each other, in order to avoid competition and imitation. Residenza Palazzo Francisci, Todi (PG). Caterina, 20. She was hopsitalized few times in different clinics because of a very serious form of anorexia that turned to bulimia, as it frequentely happens. Residenza Palazzo Francisci, Todi (PG). The garden at Residenza Palazzo Francisci, Todi (PG), one the leading center for the long term treatment of Eating Disorders in Italy. Caterina, in the garden. Residenza Palazzo Francisci, Todi (PG). Room at Residenza Palazzo Francisci, Todi (PG). Cecilia, during her hospitalization in 2008. Residenza Palazzo Francisci, Todi (PG). 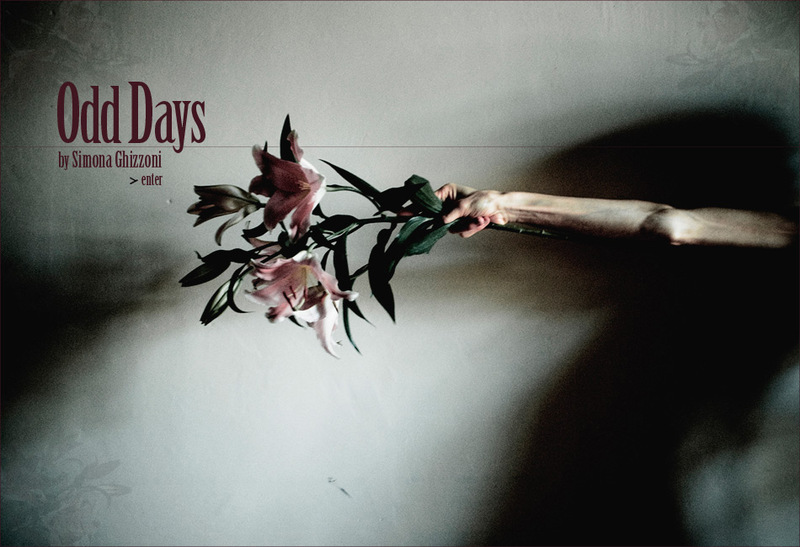 "Odd Days" by Simona Ghizzoni.Editing and sequencing Annalisa D'angelo. Composer: Simonluca Laitempergher. This exhibition requires QuickTime. |2010-09-27 18:24:52 Viile Valo - Excellent!! |2010-06-05 14:43:38 L. L. - Very Good! I like your material. The shadows/ darkness really bring an emotional connection to your work. Thank you for assembling these images. I am sure every one will learn what a tragic turn life can bring any one and any where. Please continue and eventually your images may become a book of your work. This site ' Zone Zero' is difficult to hold your pictures when I arrive here. Perhaps later it will be stable.